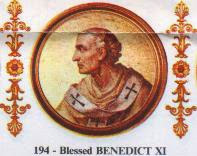 Pope Benedict XI (Latin: Benedictus XI; 1240 – 7 July 1304), born (Nicholas Boccasini) Born at Treviso, Italy, 1240; died at Perugia, 7 July, 1304. He entered the Dominican Order at the age of fourteen. After fourteen years of study, he became lector of theology, which office he filled for several years. In 1296 he was elected Master General of the Order. As at this time hostility to Boniface VIII was becoming more pronounced, the new general issued an ordinance forbidding his subjects to favour in any way the opponents of the reigning pontiff; he also enjoined on them to defend in their sermons, when opportune, the legitimacy of the election of Boniface. This loyalty of Boccasini, which remained unshaken to the end, was recognized by Boniface, who showed him many marks of favour and confidence. Thus with the two cardinal-legates, the Dominican General formed the important embassy, the purpose of which was the concluding of an armistice between Edward I of England and Philip IV of France, then at war with each other. In the year 1298 Boccasini was elevated to the cardinalate; he was afterwards appointed Bishop of Ostia and Dean of the Sacred College. As at that time Hungary was rent by civil war, the cardinal-bishop was sent thither by the Holy See as legate a latere to labour for the restoration of peace. At the time of the return of the legate to Rome, the famous contest of Boniface VIII with Philip the Fair had reached its height. When, in 1303, the enemies of the pope had made themselves masters of the sacred palace, of all the cardinals and prelates only the two Cardinal-Bishop of Ostia and Sabina remained at the side of the venerable Pontiff to defend him from the violence of William of Nogaret and Sciarra Colonna. A month after this scene of violence, Boniface having died, Boccasini was unanimously elected Pope, 22 October, taking the name of Benedict XI. The principal event of his pontificate was the restoration of peace with the French court. Immediately after his election Philip sent three ambassadors to the pope bearing the royal letter of congratulation. The king, while professing his obedience and devotion, recommended to the benevolence of the pope the Kingdom and Church of France. Benedict, judging a policy of indulgence to be necessary for the restoration of peace with the French court, absolved Philip and his subjects from the censures they had incurred and restored the king and kingdom to the rights and privileges of which they had been deprived by Boniface. The Colonna cardinals were also absolved from their censures, but not reinstated in their former dignities. This policy of leniency Benedict carried out without compromising the dignity of the Holy See or the memory of Boniface VIII. Nogaret and Sciarra Colonna and those implicated in the outrage of Anagni were declared excommunicated and summoned to appear before the pontifical tribunal.